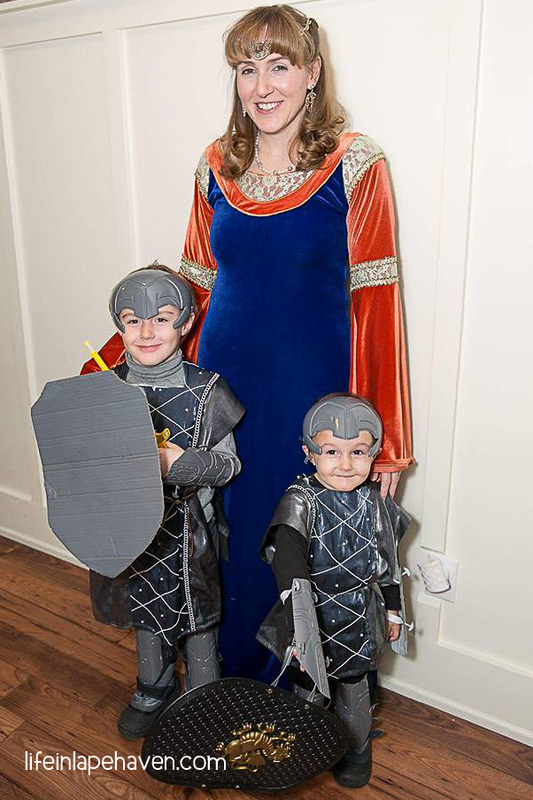 I know I’ve mentioned a few times in the past how much our family likes doing costumes (see Elijah & the Ninja Skills, for example). 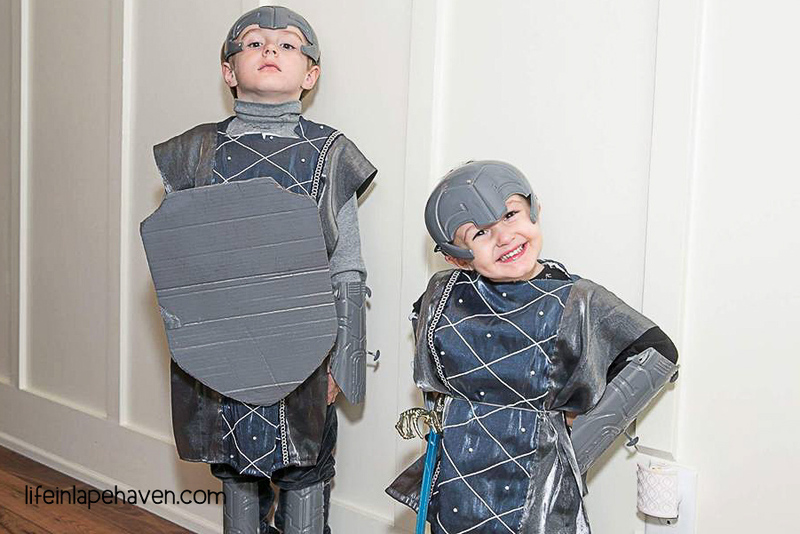 My boys love playing dress up on any given day, which is why they have a costume box in their room and why I have face paints in the bathroom (I’ve done quite a few spontaneous face painting sessions with them “just because”). 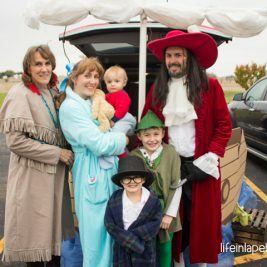 But they especially like costumes for birthday parties and our church’s annual Fall Fun Fest, and they LOVE it when we all dress up with a family theme. 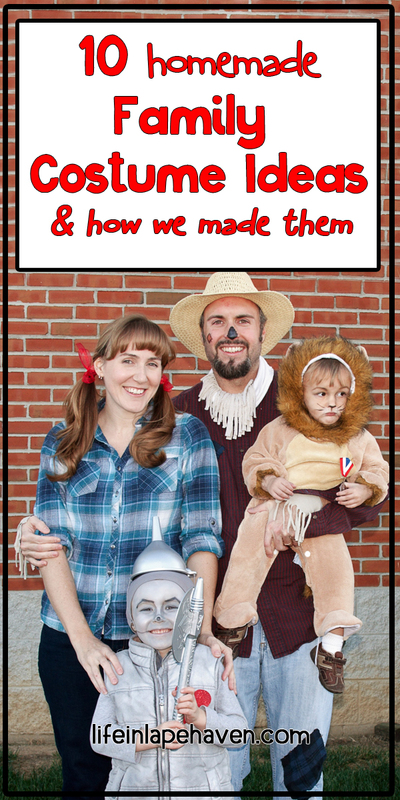 In looking for a fresh idea for this year’s family costume for the Fall Fun Fest, I began to think about all the different ways we’ve dressed up with our boys in the last 5 years (we didn’t really do much as a family until Elijah caught the “costume birthday bug” from his cousins’ party when he was 2). Before we had kids, I had my own stash of costume items from years of teaching children’s church (we did a costume day to match our lesson theme at the end of every unit), working with youth groups (one group had 4 theme nights one year, complete with costumes), and of course, Christmas plays and drama skits, so I’m usually pretty prepared for almost any character I need. Now that stash has expanded quite a bit to include costumes for all my guys. 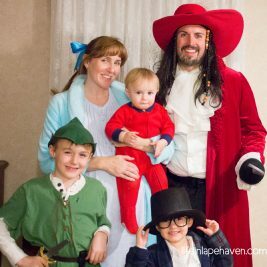 Since I know that this time of a year is kind of the peak of costume season (my own search started this post, after all), I thought perhaps you all would like to see our repertoire of family costumes in case you need some ideas for your own. 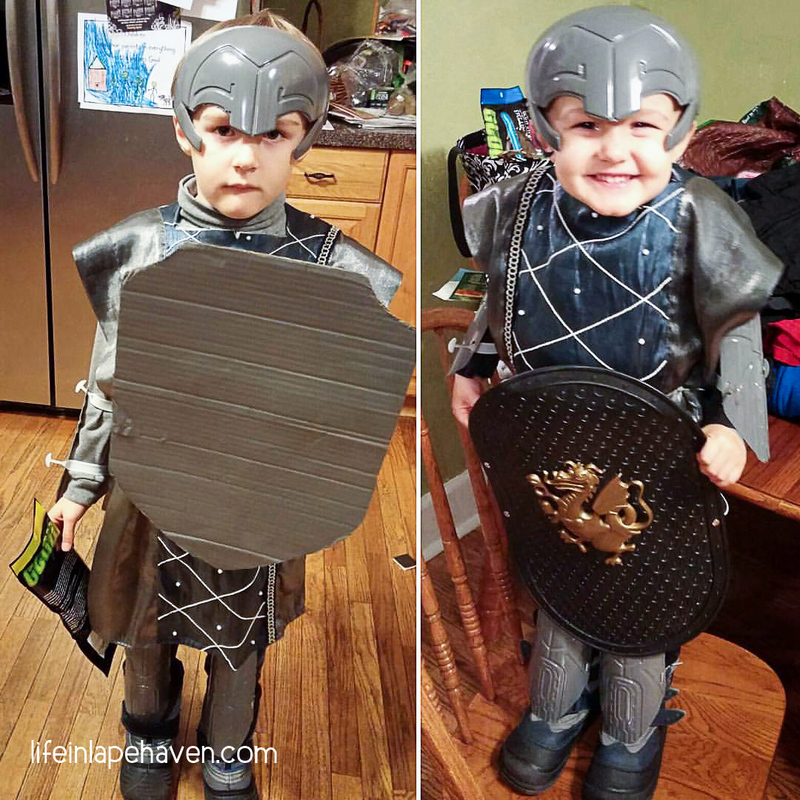 Elijah’s life would never be the same once he learned that you could have costumes at a birthday party. 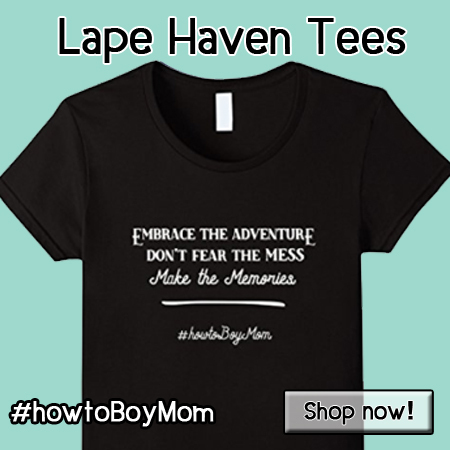 Little Pirate: For Elijah, I took a white t-shirt and black pants and cut them jagged on the edges. 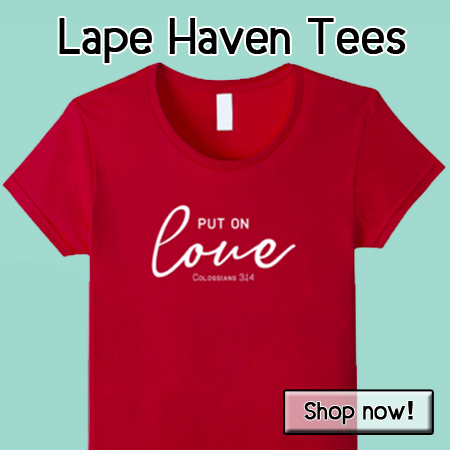 On the shirt, I cut a slit at the neck then added a few holes to thread a strip of red rawhide through it. A black vest, bare feet, a red polka-dotted tie for his bandana, and a lucky find of a pirate hat, then all he needed was a parrot. Lady Pirate: One of my most fun pieces in my stash is that crazy multi-color satiny skirt. It makes a great pirate skirt, and with all those layers, you can definitely hide a dagger in those granny boots. I added a ruffled white shirt, some dangly jewelry, a silky bandana, a few braids, and a colorful belt. 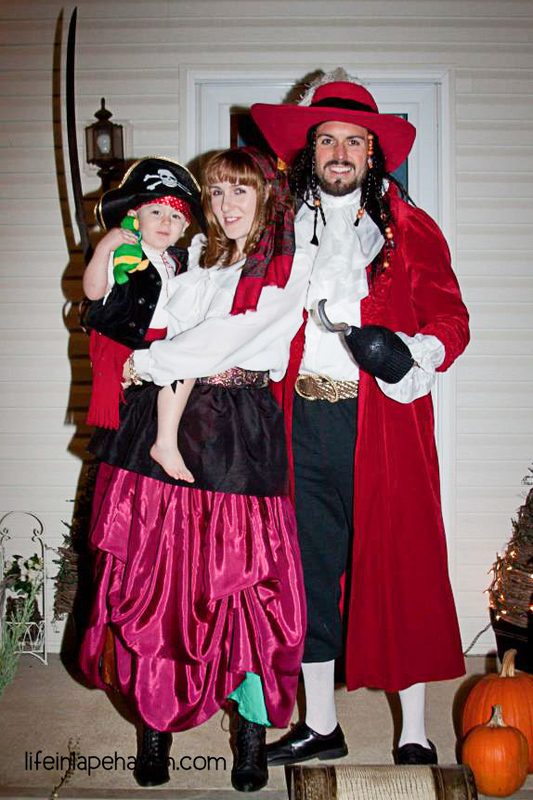 Captain Hook: The most elaborate of the costumes was Brad’s, but again, it was mostly thrift store stuff, including the Jack Sparrow wig and Captain Hook hat (both awesome finds!). For his lacy cuffs and cravat, I used the trim off a set of old curtains, and stitched the trim onto sock ends for his arms and a strip of fabric to tie around his neck. 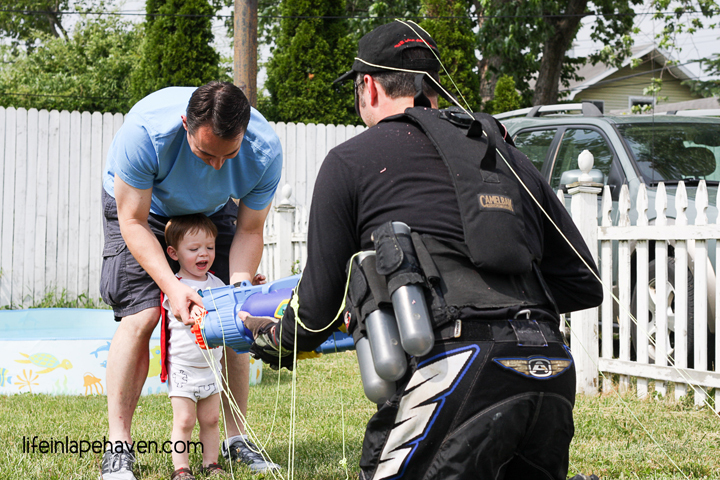 His hook was made using a pop bottle bottom, a black sock, and a Dollar Store toy hook. 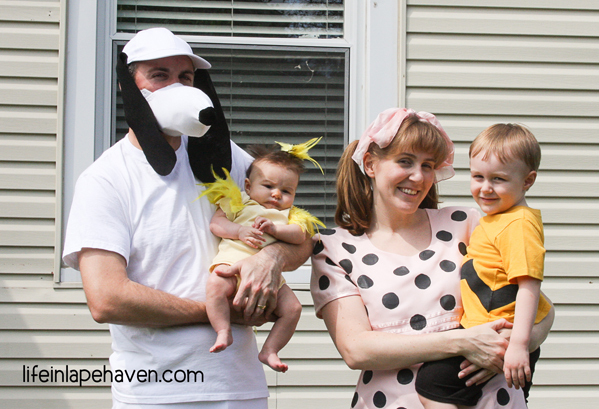 As a HUGE fan of Charlie Brown and the Peanuts, no other party theme would do for our 3-year-old Elijah, whose one real request was that everyone come in costume. 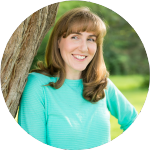 Sally: I actually had a “Lucy” style blue dress and wig in my stash thanks to a recent Charlie Brown Christmas play at church, but as I was nursing 3-month-old Josiah and still losing pregnancy weight, that dress didn’t fit. Thankfully, I found a workable pink dress at the thrift store to add black dots to so that I could be “Sally.” I added some pink shorts for bloomers and wore black flats since I didn’t have any saddle shoes. Snoopy: Brad’s costume is courtesy of my mom’s genius: a white t-shirt with a black “spot” on the back, white sweatpants with a tail added, a white hat with black felt ears, and a nose made from a pop bottle covered in white fabric. Woodstock: Our little “Woodstock” came together with a yellow onesie, some yellows feathers on fabric, yellow feathers on a hair clip, and a touch of orange makeup on his nose. Elijah also used his “Charlie Brown” t-shirt later that year for our church’s fall fest. By then Josiah had outgrown his Woodstock, so we put a red striped shirt on him and let him carry his blanket. Boom! “Linus”! 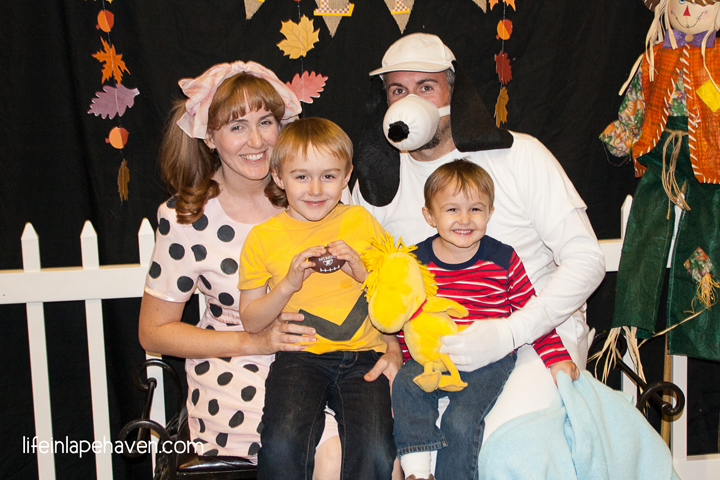 Two fall fest’s later, we all wore our Peanuts outfits for the church’s event. 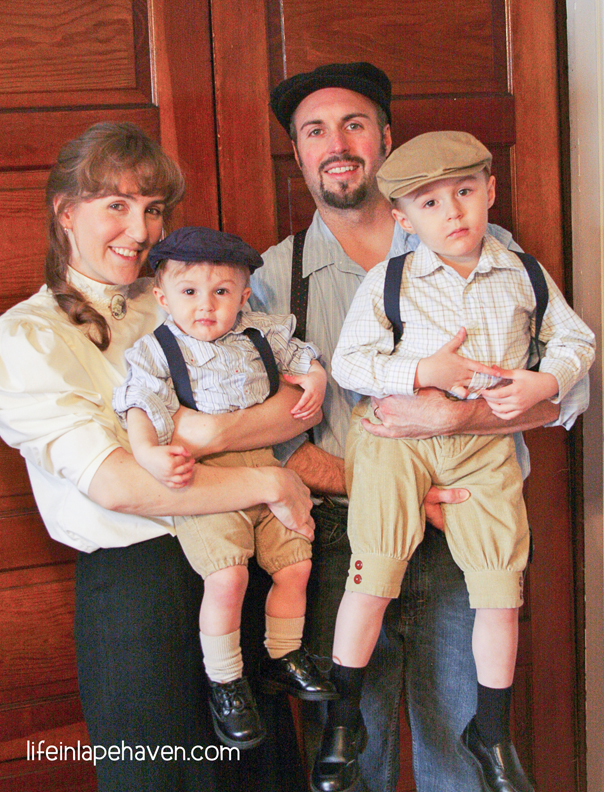 For Josiah’s first birthday, I wanted a costume idea that he would tolerate (since he wasn’t as into costumes as much as Elijah yet), so we did a Newsies party. 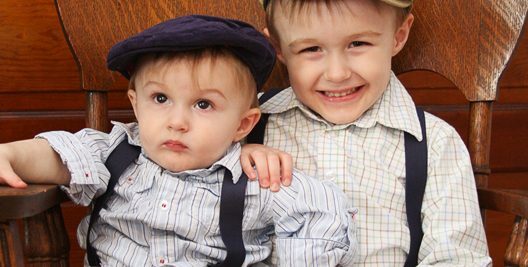 Little boys in suspenders, knickers, and caps = adorable! 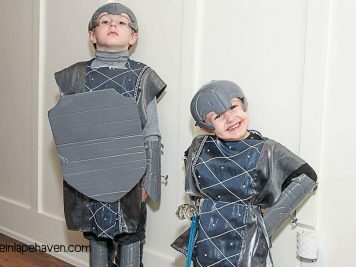 Boys: The caps had to be ordered, but the knickers were just cut off pants with buttons added at the knees. 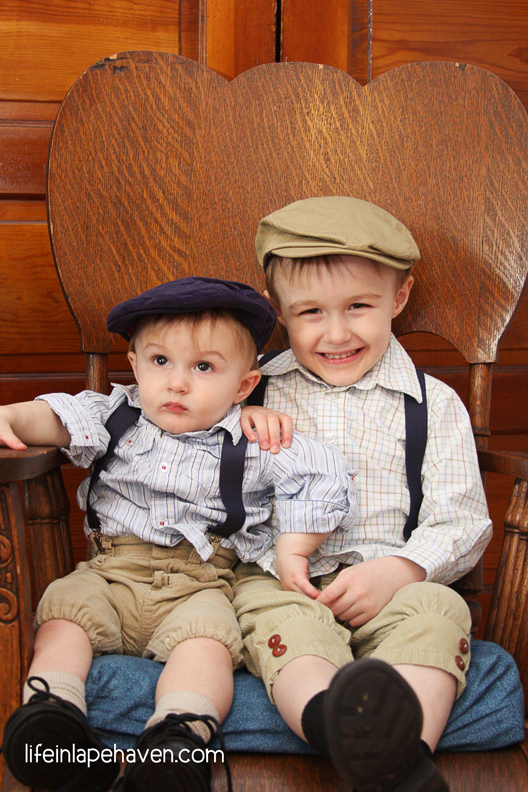 Their suspenders were blue elastic pinned on the front and back of their pants. 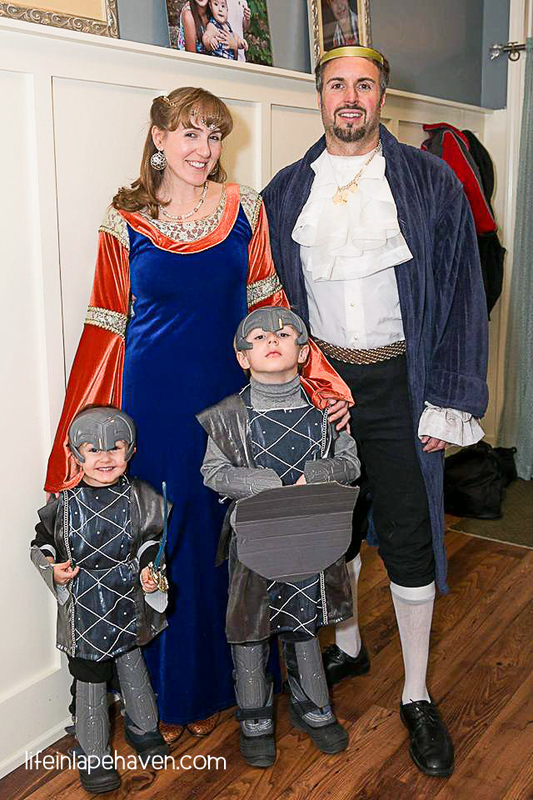 Me: The hardest part of my costume was my hair – I could have used a lady’s maid. 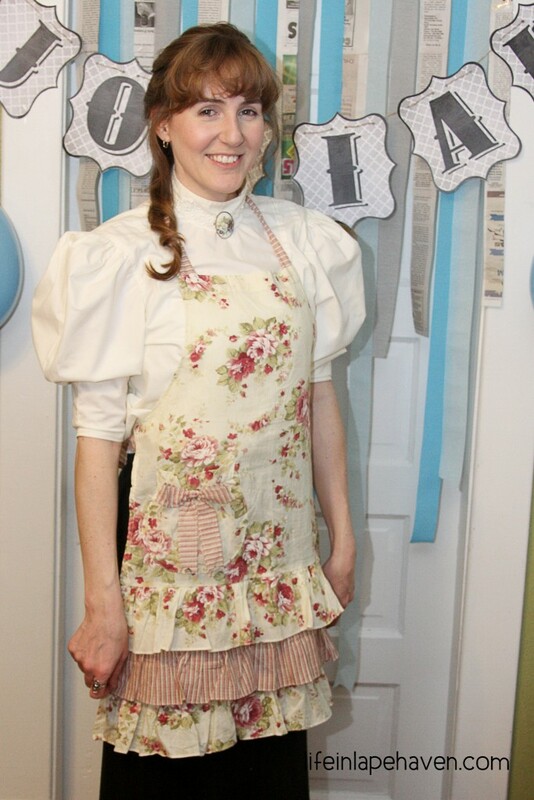 Long black skirt, puffy white shirt (something my mother-in-law found), a pretty pin from my grandma used as a broach at my throat, and an apron. Brad: Cap and suspenders from the…yep, thrift store. 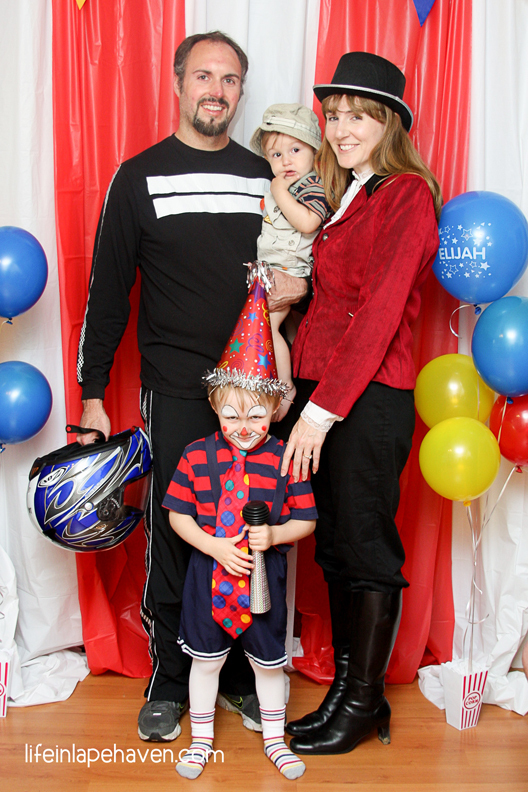 Elijah’s 4th birthday party theme was “Circus” because we knew it provided fun decorations and lots of different costume options for our family and friends. Also, my dad used to be a professional clown, so we knew we’d have an awesome clown (or 2) at the party. Clown: My mom did Elijah’s makeup since my dad has the real clown make up. His costume was again a mix and match of his closet and the thrift store. Recognize those suspenders from his Newsie outfit? His hat and silver honking horn were from the Dollar Store. And that face in this picture? I don’t know, but it made him look like a creepy clown rather than the sweet cute clown he was! Ringmaster: All I needed was a top hat from the discount store and a red jacket from the thrift store. Ruffley white shirt, black pants, black knee boots. 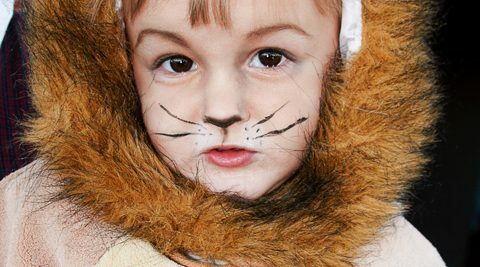 Lion Tamer: Josiah had a cute little overall set with safari animals on it and a khaki sun hat. We called our big Labradoodle, Vinny, his lion. 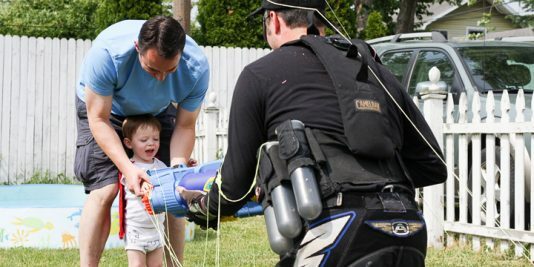 Human Cannonball: Brad’s old paintball pants, a motorcycle helmet from his dad, and a black long-sleeved t-shirt striped with reflective duct tape. Yep. 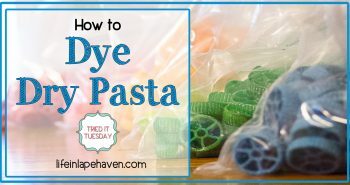 **Oh, and PARTY BACKDROP TIP** Grab a few plastic tablecloths from the Dollar Store in the colors of your party theme. 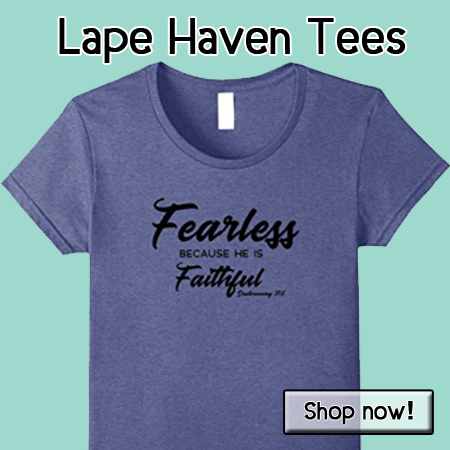 Make a “hem” on one end of each tablecloth by folding it over and taping it. Slip a rope through and hang it. It worked really well for my circus tent. 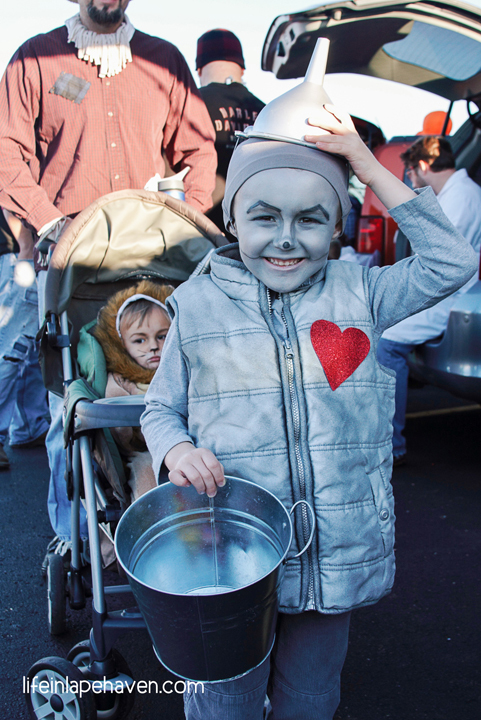 Having enjoyed his birthday costumes so much, Elijah had a very ambitious idea for what he wanted to be for our church’s next Fall Fun Fest: The Tinman. This one took some research for the face paint, but it was really fun to do. 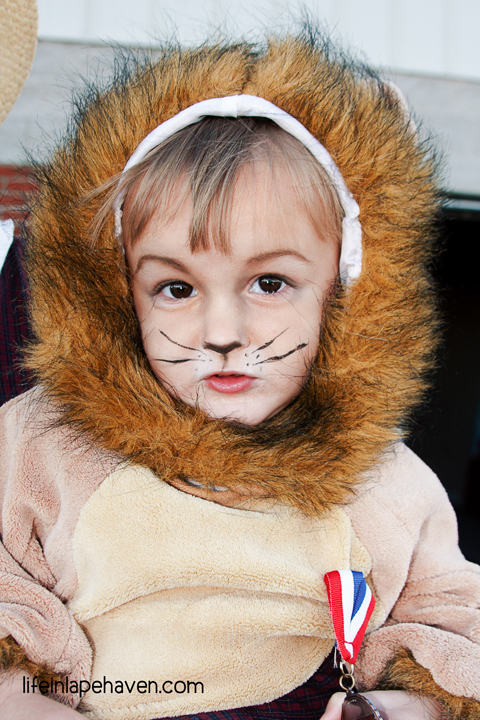 And when I found a lion costume at the thrift store for Josiah, it was perfect! 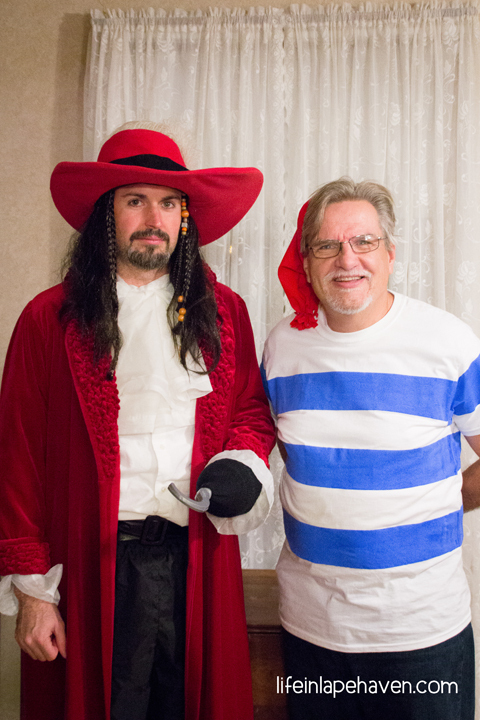 Brad and I weren’t actually going to dress up, but the afternoon of the event, I decided it would be fun. 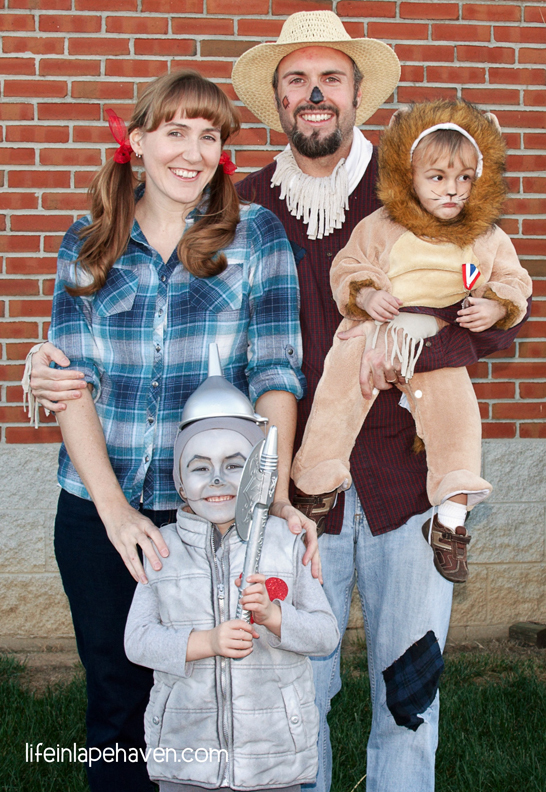 That scarecrow and very minimalistic Dorothy came together in about 2 hours. Haha. Tinman: The face paint really makes this character, so I watched a couple of YouTube videos to plan it out, and we tested it a few days ahead of time. (I just used a cheap eye shadow palette with lots of grays, silvers, and blues at the Dollar Store.) His chest piece is a puffy winter vest spray painted silver. Lion: Again, face paint makes it so much better, and again I used cheap makeup and YouTube videos. Haha. Scarecrow: Since this was thrown together quickly, I used what we had: a flannel shirt, scrap fabric for patches, embroidery floss for the patch stitches, and a few makeup accents. 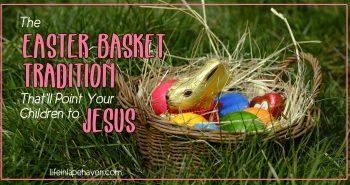 The straw-like fringe at his neck and cuffs came from a pair of tan socks that I could spare. Dorothy: The only thing I didn’t have was red shoes, so I spray painted a cheap pair of white tennis shoes with red, then added glitter. They did get a little stiff from the paint, but it was only for the evening, so I survived. 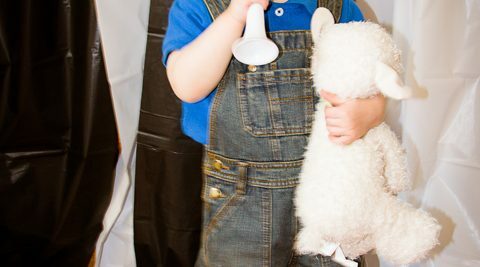 It can be tricky to find costume-friendly party themes for little ones, but the Mother Goose Nursery Rhymes for Josiah’s 2nd birthday was perfect. Jack & Jill: Brad and I just had to look as though we’d fallen down the hill, so we cut some tears in our thrift store pieces, then added some “dirt,” some bandages, and a pail for our water. 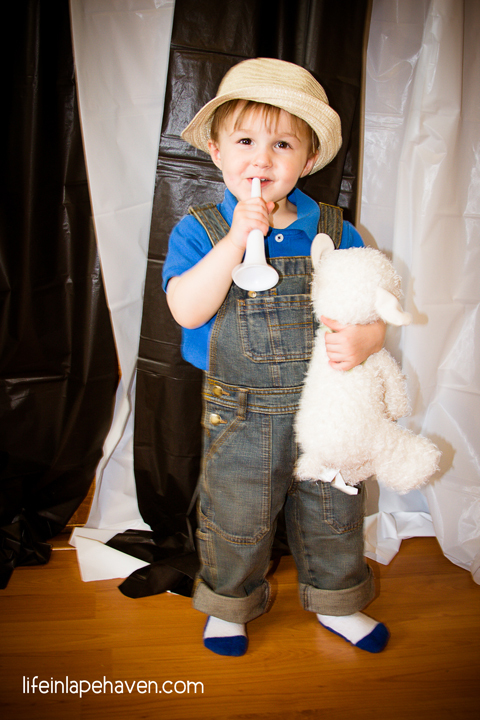 Little Boy Blue: Overalls, straw hat, horn, and a sheep. Done. 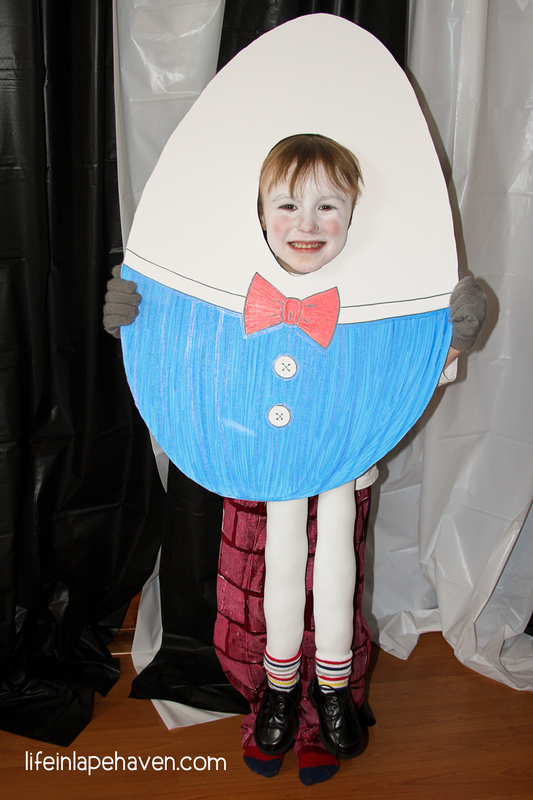 Humpty Dumpty: This may be one of my favorite costumes ever (along with the Tinman). Again, face makeup helped. 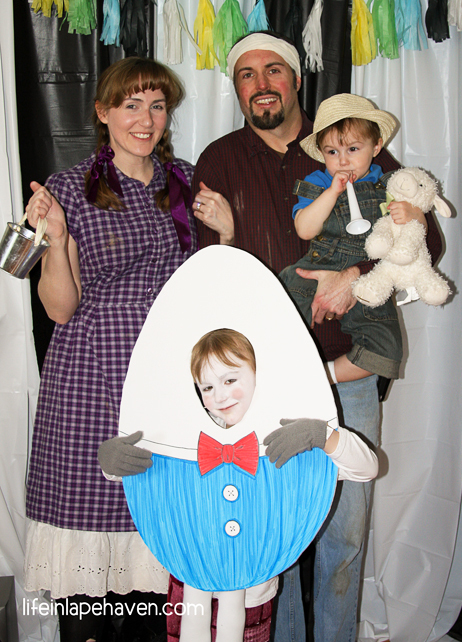 The egg was cut out of white foam board, and then I glue straps on the back so Elijah could wear it. 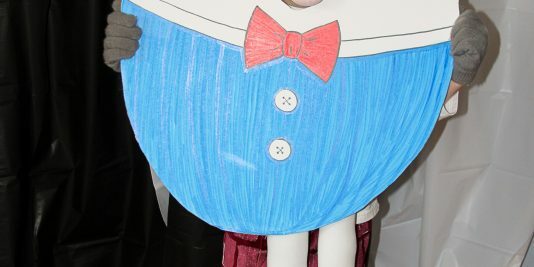 I stuffed a small pair of tights and added some of Josiah’s baby shoes to make Humpty’s legs, and Elijah wore those around his waist. For Elijah’s brick wall pants, I used a sponge to paint bricks onto a pair of red pants. So fun. Brad as the villain getting silly-stringed at the party. Line Power Guy: Elijah came up with his character, named him, and helped me design Line Power Guy’s logo – the lightning bolt with a line. I used adhesive-backed felt to create the insignia and stuck it to one of Elijah’s athletic shirts. 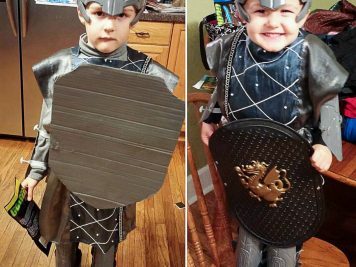 His used his gray gloves from Humpty Dumpty, a belt from Mommy, his snow boots, and my mom and I had made the capes several years before. Add a cheap mask, and you’re done. Star Power Kid: Line Power Guy’s sidekick (Josiah) had felt insignia like Elijah. I just stuck his to a pair of his pajamas. 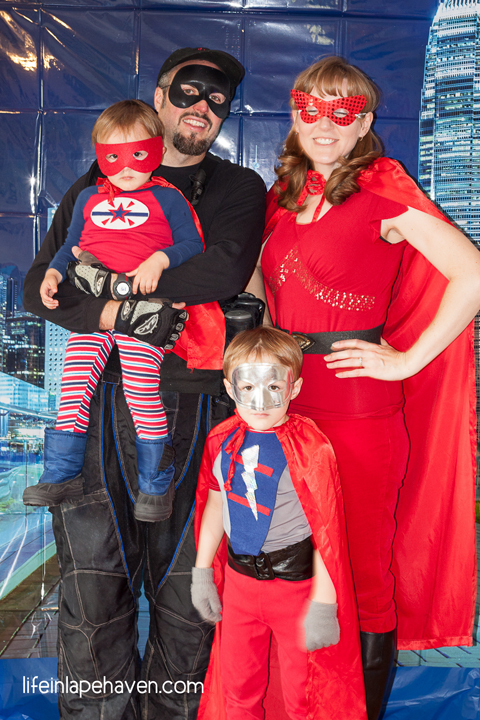 While my costume was easy and I got to be a good guy, we had a little fun and made Brad our villain. Using those paintball pants and that once-duct-tape-striped black t-shirt, we added some of his random paintball gear and a water gun. 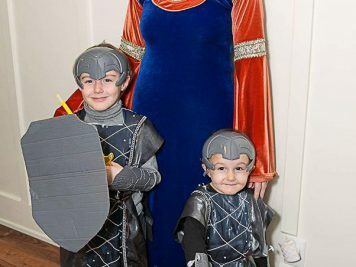 My nephews who started us off with the pirate party once again had a costume birthday that year, only my boys didn’t decide until the day before that they wanted to do a NEW costume idea for the gathering. Can you believe our royal family was put together in less than 24 hours? 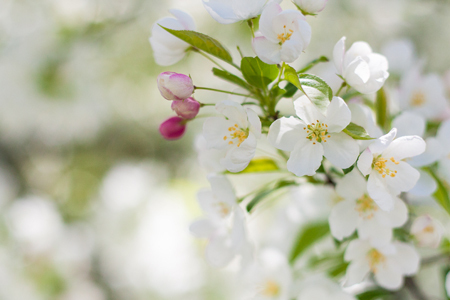 My quick picture at home. Josiah was excited! Elijah took his role very seriously. Knights: I found a table runner at the thrift store for the boys’ tunics. I cut it in half, then folded each length in half and added a hole for their head. With gray or black turtle necks and dark pants underneath, the tunics were belted with rawhide string. For their armor, I bought generic Storm Trooper pieces from the Dollar Store, cut off the bottom of the mask to make it a helmet, got out the gray spray paint, and strapped them on. And the snow boots came back into play for their feet. 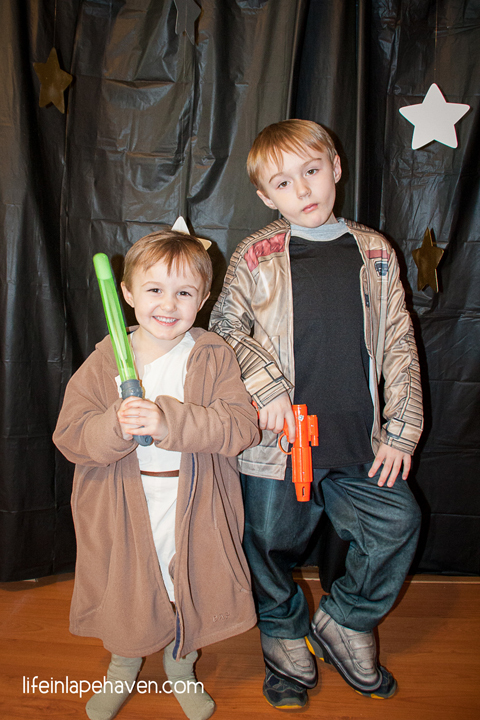 A Star Wars party was inevitable for our household, and Josiah claimed it first. Luke Skywalker: Josiah wore an adult-sized tan hoodie as his robe, a cream color shirt/tunic, and tan pants with his white socks pulled up over them (Luke wears some kind of tall boot thing). 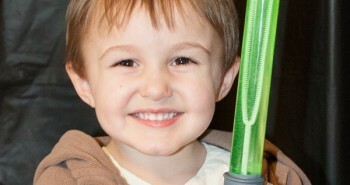 Bubble wand sticks make easy light sabers. Finn: Found this costume on clearance at Kohl’s and snatched it up. Easiest costume of the day. 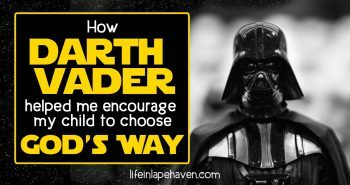 Leia: I went with Princess Leia when she was on Hoth because the long white dress that we all usually think of was way NOT practical for a mom hosting a 3-year-olds birthday party. So, we went white turtle neck, white pants, white puffy vest, grey snow boots, braided hair, and a Dollar Store blaster gun. Pew- pew! 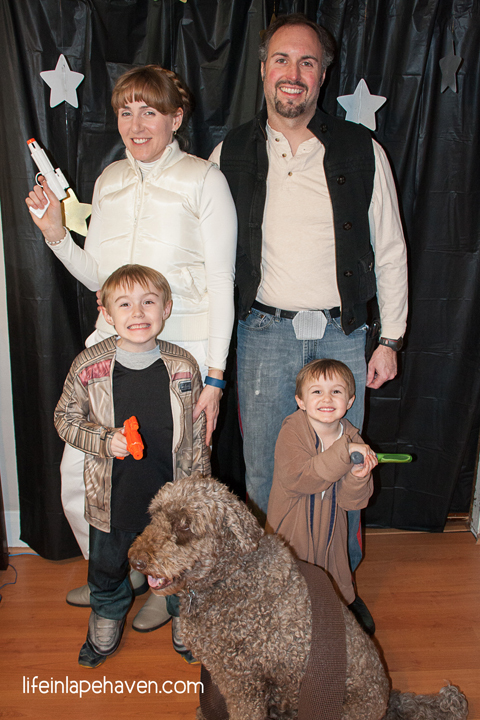 Han Solo: Of course Brad had to be the Han to my Leia, so I found a black vest that looked more utilitarian, a cream color shirt, put a red-tape stripe down his jean legs, and made a cardboard belt buckle. Chewbacca: Even our dog Vinny got to dress up. I was looking for a way to make a gun belt for him when I noticed that some shelf liner that we had had an interesting texture to it. I looped it over and pinned it together in a circle. He loved it. Hahahaha. Since I was too pregnant to be Princess Leia from Hoth by the time the fall festival came around, I switched up my costume a tad. 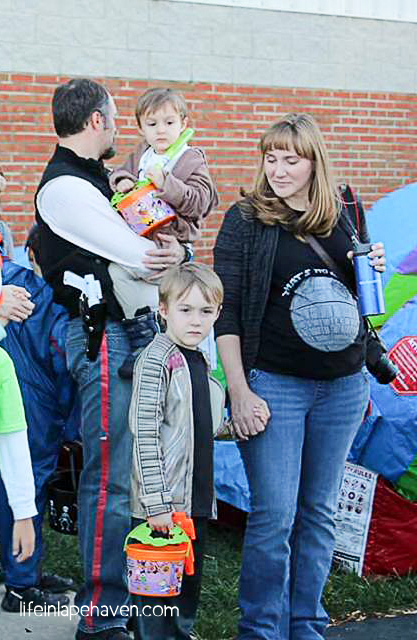 I found this silly “That’s No Moon” Star Wars Maternity t-shirt, and my boys stayed with their original costumes. This is the only family picture we got that night. 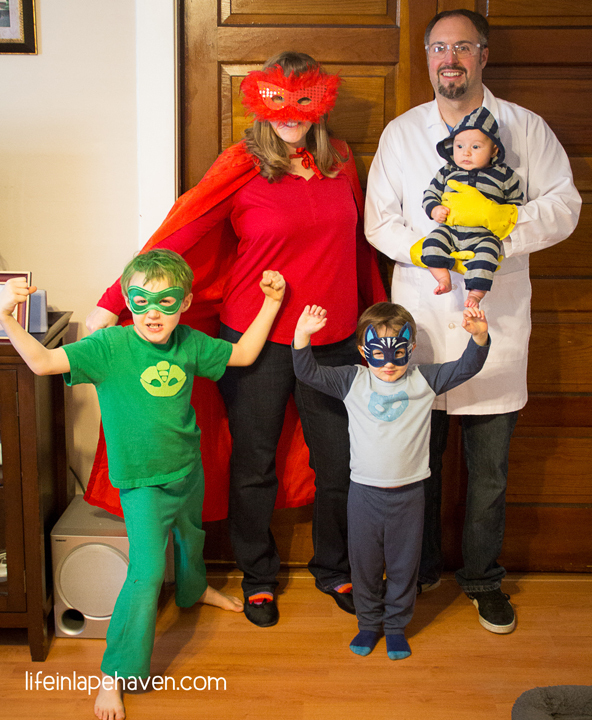 Our most recent costume party was Josiah’s PJ Masks birthday. He was super excited to be CatBoy. 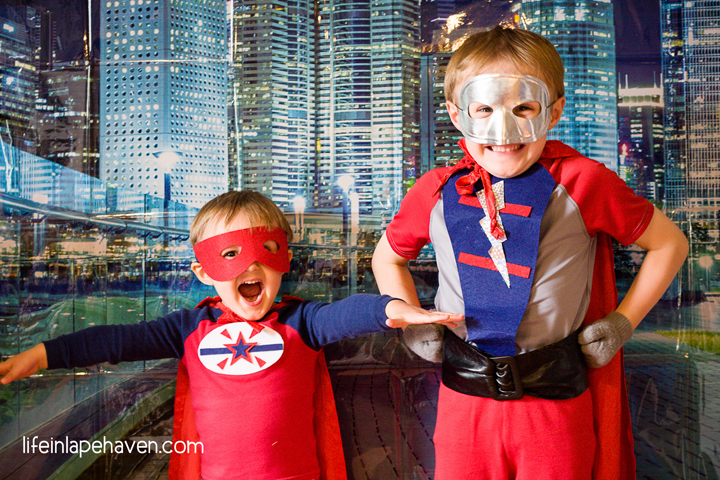 CatBoy: We found his mask on Etsy, and it was adorable and the same price as a hard plastic one from the stores. For his costume, he had a pair of pajamas from Christmas that you can draw on, so I drew the CatBoy emblem and a few stripes. Gekko: For Elijah’s Gekko costume, I used felt and some spray adhesive for the logo, and then we added some green spray to his hair. Owlette: Hello, red cape! You’ve been around a while. 🙂 I also used my red super hero mask and glued it to a red feather mask I’ve had forever. Romeo: Brad got to be our villain again, and the boys thought it was especially fitting since Daddy already had the streaks of gray in his hair like the cartoon bad guy. We purchased a lab coat (that Brad later used at our Maker Fun Factory VBS), and I pulled some cleaning gloves out from under the kitchen sink. 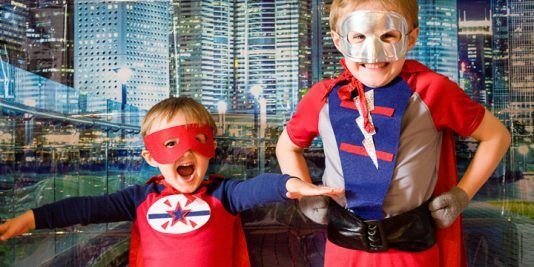 Ninjalino: Since Isaiah was so tiny, Josiah decided that he should be one of the small Ninjalinos that work with the Night Ninja. Thankfully, we had a long-sleeve romper with a hoodie with some navy blue on it. So, there you go. 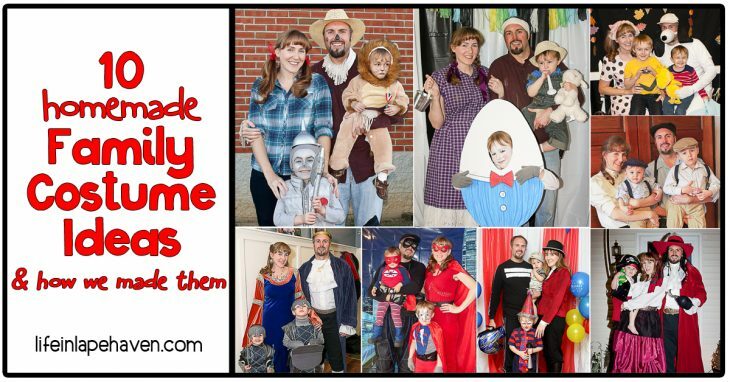 Ten costume themes from our family in the last 5 years. Here’s what we decided for our Fall Fun Fest theme. 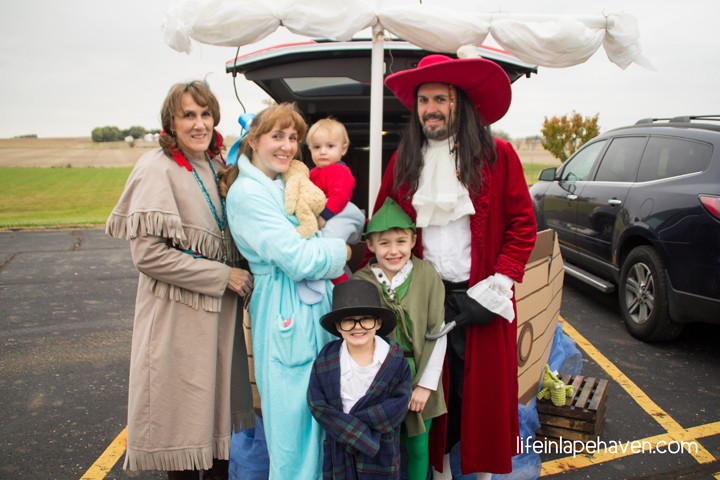 We actually opted to take part in the Trunk or Treat this year, so of course, our costumes had to match. 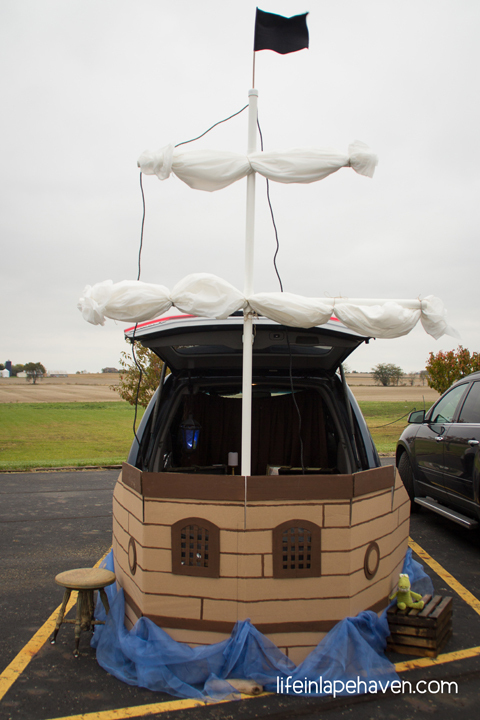 Our theme was Peter Pan, with our vehicle being transformed into Captain Hook’s pirate ship. 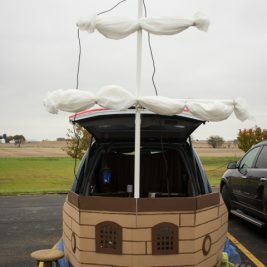 With the help of my mom, we created a boat end out of cardboard boxes, with a PVC pipe mast with plastic tablecloths as our sails. 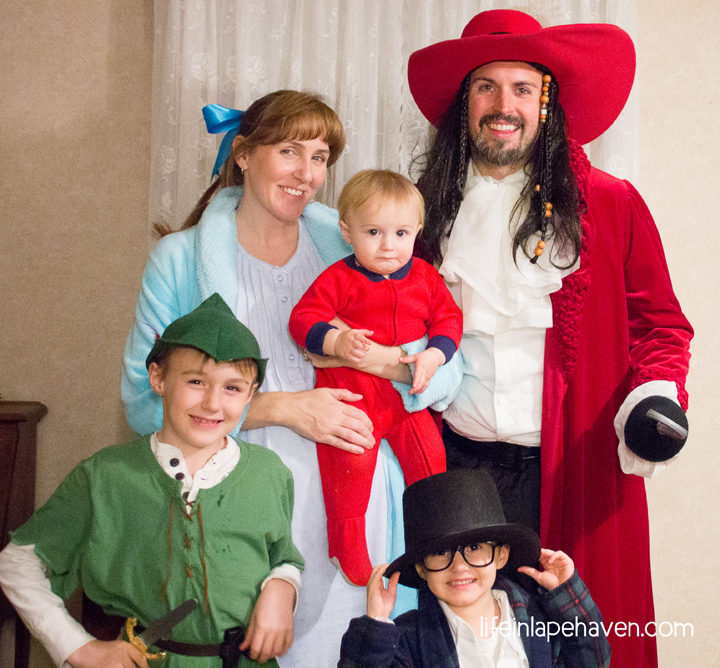 Our family as our “Peter Pan” characters. 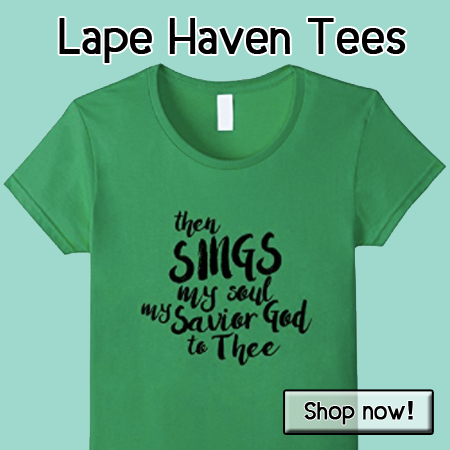 Peter Pan: A large green t-shirt cut jagged, with the neckline adjusted a bit became an easy tunic, which we paired with some green leggings (surprisingly hard to find when we wanted them). I picked up a pair of brown ankle boots at the thrift store, and we used felt and feathers to make his hat. Wendy Darling: All of the Darling children are pretty simple costumes since they headed to Neverland in their pajamas! I found a blue nightgown at the thrift store, but added a blue robe and some white leggings to the ensemble because October in Ohio can be cold. And it was cold the night of our church event. A simple blue bow on my ponytail, and some black flats as slippers, and I was done. 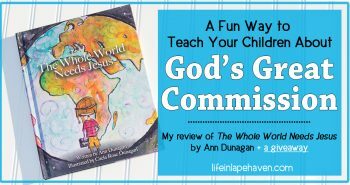 John Darling: Josiah was so proud of his top hat and glasses! I ordered his hat online, and we found a pair of cheap black sunglasses at the Dollar Store and popped out the lenses. I put him in a large white button down to mimic an old-fashioned nightshirt (with some pants underneath) and picked up a robe for him at the thrift store. And he was adorable! 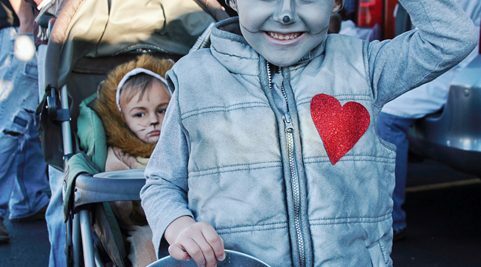 Michael Darling: This was the easiest costume of all! Isaiah in some footie pajamas with a blanket and teddy bear. 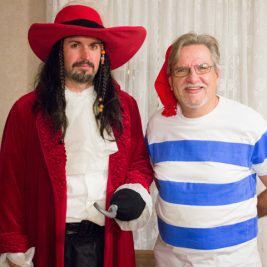 Tiger Lily & Smee: My mom made these costumes for my dad and herself, with lots of creativity and a little more sewing (especially the fringe on hers).